I'm always interested in seeing Rothrock and fish fighting. I miss the days when action stars were able to actually do the choreography, and didn't rely on horrible editing techniques to look cool. We totally agree! There was no need for quick cuts or CGI in the 80s\early 90s. Tip-top review. I just put a bunch of Rothrock movies on my Netflix Queue. Lord knows when I'll get to watching them, but it's nice to know they're there. Norton is always fun to watch, whether he's a good guy or a bad guy. I actually remember this one, but it's been forever. I'll need to dig it out and see it again! Did Norris do anything else? Videovacuum: Thanks! Very cool. Maybe one day, you can do a marathon of Rothrock! RobotGEEK: Totally agree. Norton is always entertaining. We have one more movie with him for Richard Norton Week. It will be posted Saturday. Hoaks2: It is a lot of fun! Better than the 1st one. 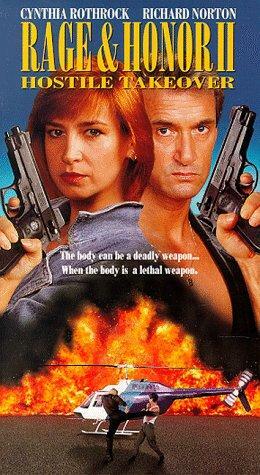 I like Richard Norton, I heard of the first one, had no idea there was a sequel though. It does seem like it'll be a cool movie and not a waste of time. We are Happy you like Richard Norton too! He always brings the goods. This was a solid sequel! Speaking of fish-fighting, Mega Pirahna took it to new levels. Think "John Cena-ish dude bicycle kicking mutant piranha as they leap from the water". It's a great party movie. Haha, that is hilarious! Will have to watch that with my buddies! My dad actually caught the end of this with me, and he was enjoying the scene where Norton beats the crap out of Tommy as much as I was. "Come on Tommy, you can do better than that. Come on Tommy." That was one of the best scenes in the movie. Tommy deserved it!